As a perspective developed primarily in anthropology, 'transnationalism' has until recently been dominated by ethnographic and textual analyses. While not problematic for any particular study, the overwhelming dominance of these methodologies has created two major theoretical shortcomings; a tendency to inflate the prevalence of transnational models of living, and the attribution of an egalitarian or emancipatory character to transnationalism, generally in the absence of systematic evidence. In this article we attempt to remedy these problems by examining the frequency and determinants of one tangible indicator of transnational activity in migrants to Australia: visits home. 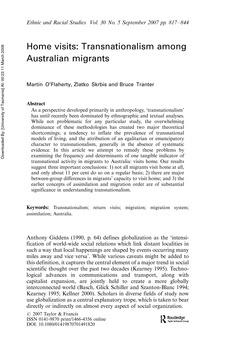 Our results suggest three important conclusions: 1) not all migrants visit home at all, and only about 11 per cent do so on a regular basis; 2) there are major between-group differences in migrants' capacity to visit home; and 3) the earlier concepts of assimilation and migration order are of substantial significance in understanding transnationalism.